In the world of Torah we often talk about the distinction between blessing and curse, between good and evil, between Yetzer Hatov – good inclinations, and Yetzer Hara – bad inclinations. Sometimes we tend to think that that’s the nature of our choices: there are good choices and bad choices. But that dichotomy knows nothing about Starbucks’ Tall, Grande and Venti. That division knows nothing about standing in front of the shelves in Trader Joe’s trying to choose a coffee that can be whole beans, ground, semi-ground, organic, fair-trade, from,Colombia Guatemala, Brazil or Sumatra. The reduction of choices to good and bad most certainly knows nothing about Netflix, Hulu, DirecTV Now and HBO Go. I think that even Playstation has a streaming service. Our world is overwhelmed by choices. I can share from my personal experience that when I decided to get rid of my smart -watch and to go for a low – tech one – I ended up lost in ‘Amazon’ trying to find a new one for about two years. The multiplicity of choices is one of the main characteristics of our society. Prof. Barry Schwartz explains what he calls ‘The official dogma of all Western industrial societies’, he says: “if we are interested in maximizing the welfare of our citizens, the way to do that is to maximize individual freedom. The reason for this is both that freedom is in and of itself good and essential to being human. And because if people have freedom, then each of us can act on our own to do the things that will maximize our welfare. The way to maximize freedom is to maximize choice”. He explains that this is so deeply embedded in our society that it’s hard to question this statement. Yet there is a problem with this premise. Prof. Shwartz continues to explain: “All of these choices have two effects on people. One effect, paradoxically, is that it produces paralysis, rather than liberation. 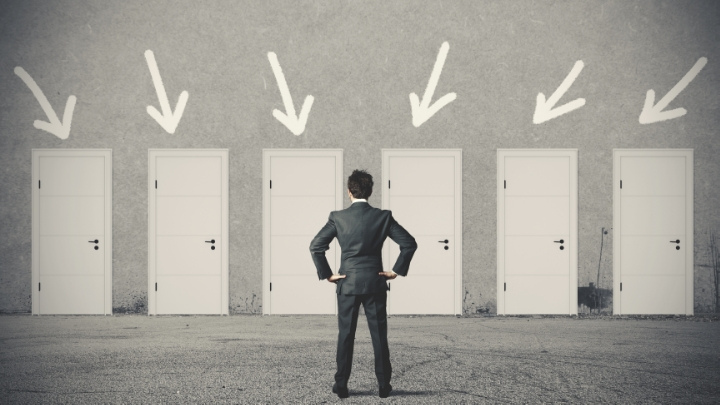 With so many options to choose from, people find it very difficult to choose at all… The second effect is that even if we manage to overcome the paralysis and make a choice, we end up less satisfied with the result than we would have been if we had had fewer options to choose from”. And that is because with so many choices, there should be a perfect match for you. Therefore, even when you walk away with something that feels and looks very good to you, you still can’t avoid thinking that you probably missed the opportunity for something else that would have been Perfect. Prof. Dan Arieli quotes the results from a study about organ donation. The study looked at 11 countries and found that they could be clearly divided into one list of countries with a very high percentage of drivers signed up to be organ donors, and a second list of countries in which a very low percentage were donors. It turns out that their choice has nothing to do with their culture or with how convincingly they beg people to join the organ donors list. It is all about a form at the DMV. The countries with the low donors rate have a form that says “Check the box below if you want to participate in the organ donor program.” What happens? People don’t check the box, and they don’t join. The countries with a high percentage of donors have a slightly different form. It says, “Check the box below if you don’t want to participate …” Interestingly enough, when people get this, they again don’t check the box, but now they join. So while we would like to believe that our choices represent our values, it turns out that very often they just represent our lack of ability to choose. “I am sure many of you have had this experience — it’s late at night and you start browsing Netflix looking for something to watch. You scroll through different titles — you even read a few reviews — but you just can’t commit to watching any given movie. Suddenly it’s been 30 minutes and you’re still stuck in Infinite Browsing Mode, so you just give up — you’re too tired to watch anything now, so you cut your losses and fall asleep.” Davids continues: “I have come to believe that this is the defining characteristic of our generation: Keeping our options open. There’s this philosopher, Zygmunt Bauman — he called it “liquid modernity” — we never want to commit to any one identity or place or community… so we remain, like liquid, in a state that can adapt to fit any future shape. Liquid modernity is Infinite Browsing Mode… but for everything in our lives”. Infinite browsing mode…Where in judaism is infinite familiar to us? Maimonides explains that the universe was created “Yesh MeA’in” – literally, from “nothing”, and Kabbalah teaches that the word Ain also points to the word Ein-Sof, the infinite. God Itself is recognized as the infinite. The same Kabbalah also teaches the notion of Tzimtzum, reduction. In order to allow the creation of the world, the Ein-Sof, the Infinite, needed to reduce itself, to step back. How does this notion of Tzimtzum, of reduction of the infinite, work with our living in the “infinite browsing mode”? Similar to the reduction that Kabbalah describes in the creation of the world, every time that we narrow things down, every time that we leave something behind and eventually, make a choice, that reduction is in fact helping us to create our own worlds. And of course we are not talking about the size of your coffee, your streaming tv service and not even about choosing a watch. We are talking about the way in which we want to live our lives. We are talking about the conscious use of our free will. Some of the foundational ideas of our Jewish identity have to do with moments of choice. For you are a people consecrated to Adonai your God: YHVH your God chose you from among all other peoples on earth to be His treasured people. So we are treasured by God, we are his chosen People. But the origin of this choice is reciprocal. We ourselves also made a choice to accept Torah. And how did we come to this choice? The Midrash tells that when Israel stood at the bottom of Mt. Sinai, God in fact “held the mountain over them like a barrel and said ‘If you accept the Torah, it is good. And if not, here shall be your graves’ “. Guess what they chose! Thank God the People of Israel did not have ten options, because we probably would still be at Sinai, trying to figure out what to do! So obviously we don’t want to make our choices feeling that we’re going to lose our lives. But we also don’t want to lose – “waste” our lives in the abysm of our lack of determination. I think that there are two important ideas that can help us find resilience in the liquidity of the “infinite browsing mode”. These ideas are commitment and distinction; and translated to the language of Jewish values: Mitzvah and Kedushah. One of the direct consequences of not making choices is the lack of commitment. The word “Mitzvah” means commandment but implies the reciprocity of commitment. Fulfilling a Mitzvah is in fact expressing a commitment. But We don’t want to commit because we don’t want to miss anything. The problem is that when we focus on keeping all our options open we enter an alley without an exit. Making a commitment will break the infinity of the browsing mode, creating clarity in our blurry reality. This will help us exchange the notion of the alley without exit to the one of a path. The other concept is distinction, Kedushah. The notion of Kedushah and the notion of choice are tightly related. The action of “Lekadesh” – to make something holy – means to make a distinction. For example, in the book of Genesis we learn that YHVH on the 7th day created Shabbat, the resting day, and “V’yekadesh Oto” and made it holy, which means that He made it distinctive from all the rest of the days. A very important value in Jewish tradition is Kedushat HaChayim, the holiness of life. We make our lives holy by creating distinctions that help us hold and define meaning. In Shabbat and on holy days we do Kiddush, as we announce that we have gathered together with the purpose of celebrating and recognizing a different and joyful time. In the context of matrimony, Kiddushin are the moment in which two individuals say to each other and to the world that they are united, that they are connected “Ze LeZo” – to each other, by a distinctive tie. And once again, in our memorial prayer, in the Kaddish, we want to acknowledge that there was a presence in this world that was distinctive to us. Rabbi Arthur Green Says about the Kaddish: To say it, is to accept the reality of death and to declare one’s commitment, in that moment, to the holiness of life and the obligation to bring forth holiness in this world. The good and the bad news is that we have no chance of creating holiness in our lives without making some very clear choices. Furthermore, holiness can’t be retained without commitment. Seeking a meaningful life requires our commitment, determination and dedication. Meaning is not a result of keeping our options open, it is actually more likely to be found when we challenge the “liquid modernity” of our existence. Meaning emerges when we break the infinite browsing mode with an act of distinction or commitment. Don’t think for a second that I am suggesting that this is an easy task. We are talking about the ability to challenge the ethos of our time. When we are talking about our identities, our relationships, our life perception, it is truly hard work; but the outcome of keeping this “infinite” is a life without self-definition, it is renouncing the privilege of creating our own world. We started our conversation referring to the idea that freedom is achieved by having multiple choices. However in Jewish tradition from a very early age we learn that we celebrate and exercise our freedom by learning how to ask questions. Maybe questioning is the key to breaking the infinite browsing mode and to making choices. What makes my time special? With whom do I want to spend my time? What do I want to commit to? What do I want to make distinctive in my life? Where do I find meaning? If we allow these questions to be present in our routines while our actions reflect our commitment to respond, we will overcome the paralysis of the Infinite Browsing Mode. We will express the freedom of defining who we want to be. We will certainly lose something, we will reduce some of our options, but at the same time we will gain the privilege of creating our own world, a world in which we really choose to be.